Jack Lee likely deleted a thread on his blogpost The Bible Verse That Made Me a Calvinist, because it definitely undermined his entire take on this verse. This would be more evidence of Calvinist intellectual dishonesty if true. There is actually a good case that this is a mistranslation. The verb very well can be reflexive. “As many as appointed themselves to eternal life believed”. It makes better sense in the context of what is being said. Here is a Greek lesson for you. When translating Greek middle/passive forms of transitive verbs you may need to try both middle and passive translations to see which makes best sense in the context. Does that make sense? Turning to other parts of the Bible wont help much, because immediate context is the determining factor. In fact, two verses earlier, a middle/passive was translated as a middle. Are you going to argue it should be passive? Act 13:46 And Paul and Barnabas spoke out boldly, saying, “It was necessary that the word of God be spoken first to you. Since you thrust it aside and judge yourselves unworthy of eternal life, behold, we are turning to the Gentiles. The case for Acts 22:10 being a Calvinistic verse falls apart with basic knowledge of the Greek language. In fact, this verse potentially destroys Calvinism. Christopher, thank you for reading and commenting. I am aware of this understanding/translation but it does not hold up when comparing the same word in other places in scripture, specifically the same book. Consider Acts 15:2, 22:10, and 28:23. This understanding of the word is consistent with Acts and the rest of scripture. That is just not what this is about. If my argument is that a middle/passive determination can only be made based on context, then turning to other parts of the Bible for similar usage is useless and dangerous. That would be like trying to determine the meaning of “bat” in an English story by turning to a completely different part of a story, whereas the context tells you more about if it is a flying bat or a wooden bat. Just that this is about verb voices! The word used in the Greek translation is τεταγμενοι (tetagmenoi) which is from τασσω (tasso) which means I appoint. Do you understand parsing of a verb? In Greek, after you parse a verb you can see who is the actor of the verb. Does that make sense to you? The verb supports a reflexive translation, meaning the people could be appointing themselves. And because the context uses other reflective verbs, it is also the most likely rendering. If people appoint themselves, doesn’t Calvinism fail? Christopher, I think you are fighting against what scripture plainly says. Does God say He thought He was going to do something but did not do it? Thanks for the dialog. Every major bible translation (save the message) does agree with our interpretation of Acts 13:48. That includes most bible scholars and much of church history. Psa 139:4 Even before a word is on my tongue, behold, O LORD, you know it altogether. Yesterday’s article was a little tongue-in-cheek. William Birch, instead of answering my points in a rational manner, engaged in a long diatribe. I noticed pretty quickly that all his arguments could equally be made by a fanatic attempting to defend an image of God with wings based on shoddy prooftexts, hinging on little concern for basic principles of reading comprehension, and reinforced with arrogance and self-righteousness. Literally, Birch scattered his article with claims that his reading was the “prima facie” reading. And here I thought reading comprehension was the tool which instructs people of the “prima facie” reading of a text. Certainly, when I quote an Open Theist using the exact same words as God in Psalms 139, this is not a “prima facie” claim to some sort of omniscience. Birch does not seem to understand this, and instead lashes out that a little girl is not omniscient. That is the point, Mr Birch. Someone with good reading comprehension skills might pick that up. If non-omniscient beings can say a phrase AND it is not a claim for omniscience, then God saying the same phrase COULD also not be a claim for omniscience. The “prima facie” reading just cannot be assumed to be one of omniscience. 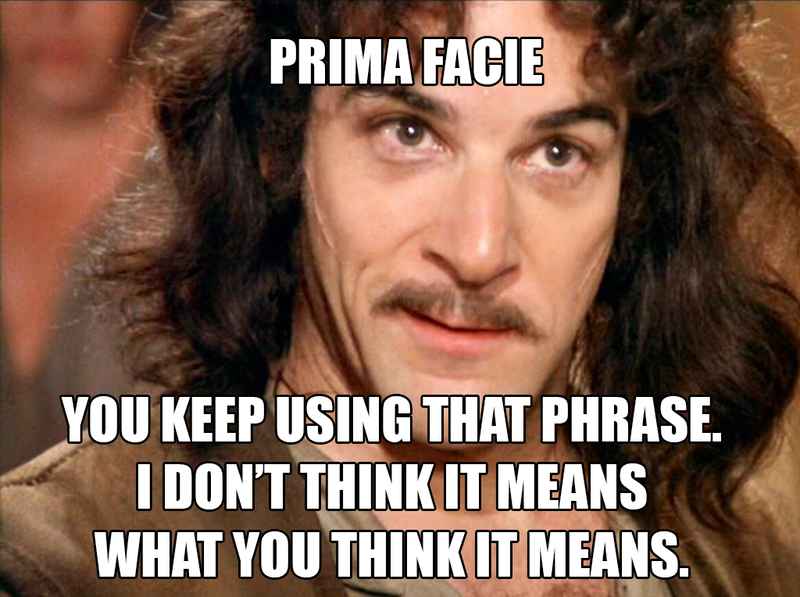 I am fairly sure William Birch does not understand what “prima facie” means. It means “on face value”. What is the most natural meaning of the text? One cannot just assume their own reading is the “prima facie” reading of the text. That is what the entire discussion is about. Birch engages in the begging the question fallacy (added to his moralistic fallacy, dignum deo fallacy, hasty generalization fallacy, and equivocation fallacy). The text in question uses first person pronouns, and Birch actually believes (he really believes this) the “prima facie” reading is that the text should be generalized. What leads you, Mr Birch, to thinking that a Psalm filled with personal pronouns is just directly applicable to everyone? What in the text leads you to believe that was the author’s point? In my blog and podcast on Psalms 139, I detail reasons to believe that this Psalm is just not generally applicable (first person pronouns should be our first giveaway). Imagine if we came across the following sentence: “I will bring my kids rollerskating tomorrow.” The “prima facie” reading is not one of generalization; only someone with serious reading comprehension problems would claim that “all people everywhere are bringing their children skating tomorrow”. But Birch commits this error, and arrogantly, when he approaches his prooftext. He cares little to hear any other reading, no matter how probable, and no matter how rational. When I point out the litany of logical fallacies that Birch commits in regards to Psalms 139, this tells us something meaningful about the text. Logical fallacies help us understand what the author most likely meant by informing us on possible and probable meanings. This is all basic reading comprehension, and is not controversial. When Chris appears in the comments section of any post that is challenging Open Theism, on the Society of Evangelical Arminians Facebook outreach page, one can be certain that, by tone and by polemics, the conversation will devolve into linguistic carnality. This is an interesting claim because I am a new member of this particular Facebook group. Before my first article about Birch’s dishonesty I was surprised to find that the only thread in which I ever participated was deleted by William Birch. I have since only engaged in one other thread in which Birch falsely accuses me of lying when I say that Birch deleted our prior conversation. So, a reader can gauge Birch’s claims that “any post” in which I engage I devolve the conversation. If defending oneself from Birch’s lies is “linguistic carnality”, I am fine with that. He might be referencing my actions from other groups (which may be more accurate), but one would be hard pressed to find me treating Birch unjustly, as I had always assumed that he was a rational man. In my latest Facebook thread with William Birch (prior to his latest article), he explodes at me for suggesting he deletes threads. In fact, he did delete threads and now admits it with pride! Birch faired very poorly on that online discussion when I tried to ask him very basic reading comprehension questions about Psalms 139. He became angry, and instead of discontinuing his discussion like a well-adjusted adult, deleted and entire thread of hard crafted comments. This took me off-guard because I did not expect such blatantly dishonest and petty behavior. I keep threads by Calvinists screenshoted because this dishonest practice is common among them. It is common on Facebook groups to outlaw this practice as it is rude and disingenuous. I did not expect this serious character deficiency from Birch. Mr Birch then accused me of lying. He claimed he never deleted any threads (I admitted I did not have the evidence because he deleted it!) and only after I explained the situation did Birch admit to deleting threads. I screenshotted his admission because I was not to be fooled by Birch again. As soon as I mentioned I screenshotted his admission of guilt, he blocked me (displaying more intellectual dishonesty). He never offered any apology for his accusations that I would fabricate such an event. Intellectual integrity is championed above all else on my blogs, and I take any assault on my intellectual integrity as a serious offense. When reading Birch, he likes to posit all sorts of wild claims without a shred of evidence (note the comment about my activity on a Facebook group in which I have no activity). Birch does not fail to misrepresent and outright lie. The reader should take pause and evaluate who has the cleaner record of intellectual integrity. Birch claims my demeanor is the reason he deleted the thread, as if that is a valid reason to remove comments or as if tone is not widely misread on online discussions. More accurately, Birch was ignoring specific and direct questions about the text in question. It became a biting embarrassment to him. Again, these were questions on basic reading comprehension. When Birch accuses me of poor demeanor, the reader will just have to take Birch’s word for it (because he deleted all evidence of the thread!). But I am sure that someone willing to strike an entire conversation from the record is also honest enough to recount it accurately for his own readers (including accurately recounting my “tone”). If Birch has the Facebook notifications to re-create that thread, I will offer him money for them ($50.00) with his permission to publish in full. But I am sure that even if he had the thread, he would not want it published. Such is the life of one so willing to delete entire threads of comments (I wasn’t even the only one commenting on the thread!). Birch does his best to highlight any typos in my post. I suspect this is an attempt at an ad hominem fallacy (trying to discredit a person rather than their ideas). 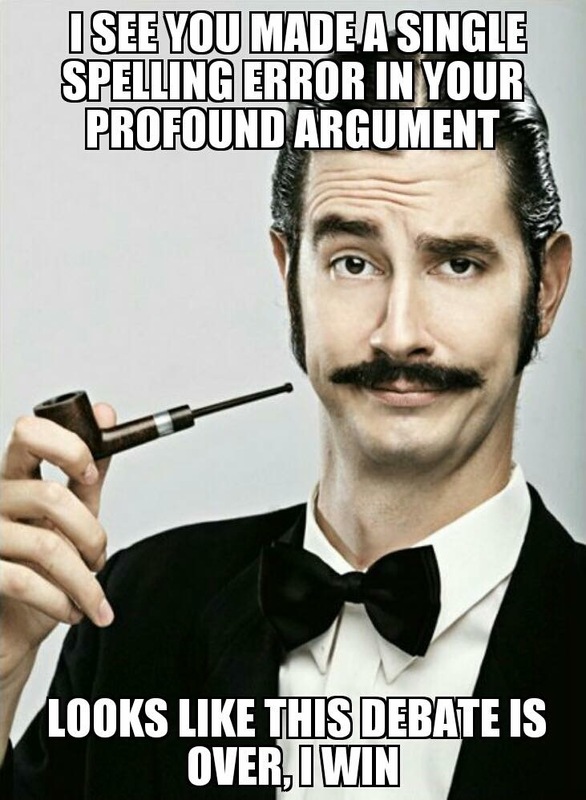 If Birch (or anyone else) wishes to accuse me of ad hominem in return, I would direct him to my podcast on logical argumentation. Calling out someone as dishonest is not an ad hominem. Birch’s dishonesty was the point of my first post, my evidence was his behavior along with his ignoring valid counterarguments (now I get to add his most recent post as collaborating evidence). The argument was not to ignore Birch’s arguments because he is dishonest, but the argument was that Birch ignores counterarguments (reflecting on this, maybe he just doesn’t understand them). Regardless, Birch has done something useful by pointing out my typos. I would like to use this opportunity to extend William Birch a formal proofreading job. Regular readers will notice I have plenty of spelling errors, and the like. Sometimes, to my horror, I negate or fail to negate entire sentences. If Mr Birch were to proofread all my articles and even my book, I would gladly pay him $1.00 per spelling, grammar, or word choice error that he finds. This would have the happy consequence of Mr Birch becoming better exposed to rational argumentation. Everyone is a winner. Only some snark added: Mr Birch, send me your PayPal and I will send you $2.00 for your latest astute proofreading observations. Maybe Birch should have become a professional proofreader? He seems good at it. Recently on a medley of Open Theist facebook pages, a man named McLoughlin has been asking questions and refusing to answer any. This is just another data point that the critics of Open Theists are disingenuous and do not answer questions, and are generally ungracious to other people’s positions. McLoughlin [in response to someone else] You say that you see flawed thinking from me. Yet, you have not shown that flawed thinking. If God always knew for certain that Jesus would die by Crucifixion, then He would have always known for certain that the Roman Empire would exist who would execute Jesus on a Cross. Chris Fisher The Bible presents the Crucifixion as an event that did not have to happen.In fact, you would be hard pressed to find one prophecy about it. Chris Fisher In response to the OP [a YouTube video]. This guy is not very interested in Biblical theology. He wants to engage in philosophical speculation. That is fine. But the Bible nowhere presents timelessness and a concept that was even entertained. Instead, presentism is the time philosophy of the Bible. God here says that He anticipates doing something in the future that will remind Him of the past. I am not coming from a Calvinist position. I am not a Calvinist. I did refer to the above article and this is why I state this. So, You are saying that God was not always certain that Jesus would be Crucified ? Chris Fisher Yeah, so let’s look at the evidence, we will start with a few of Jesus’ own quotes. Here is Jesus before he is arrested. Mat 26:53 Or do you think that I cannot now pray to My Father, and He will provide Me with more than twelve legions of angels? Does Jesus believe that he can pray to God and God would deliver him from the Romans? Is that something Jesus believes he can do? I am a person who wants to get to the nitty gritty straight away. So, all I pretty much ask from people is that can simply answer the question. So to just clarify with you and to make it clear …. You are saying that God was not always certain that Jesus would be Crucified ? Chris Fisher Yes. I’ve said it a few times and posted an article I wrote saying that exact thing. The links are to my blog page. [Edit] I direct you to my reply comment above where I write “The Bible presents the Crucifixion as an event that did not have to happen.” That is pretty clear, right? And then I link an article I wrote about it. Then the conclusion must be that God could never be certain that people would be saved nor that there will be a redeemed. Chris Fisher No, that is a stupid conclusion. Chris Fisher But anyways, howabout now we deal with the Biblical evidence I present that the crucifixion did not have to happen. I posit that you want to use the Morallistic Fallacy to drive your beliefs. Then God must have always been certain that Jesus would die to save and redeem people. Then the conclusion must be that God cannot be certain that people will be saved nor that there will be a redeemed. Chris Fisher Nope. Howabout we stick to the Bible instead of philosophical speculation? How about I question you to expose your contradictions ? Chris Fisher I’ve answered your questions and you have not answered any of mine, and I am really not interested in wild speculation. So maybe you can post Bible verses that back up your wild speculation.We can start talking about the Bible. Yeah, so let’s look at the evidence, we will start with a few of Jesus’ own quotes. Here is Jesus before he is arrested. It is a “yes” or “no” question. I am not speculating. I am sticking to reason and logic. You are in essence contradicting yourself. It is one or the other. Which one is it ? Here is Jesus before he is arrested. Chris Fisher So, type two letters (no) or three letters (yes), hit enter. Then magically, you will also receive an answer to your latest question. Come on, I know you can do it. I am not at all interested in discussing Bible passages. Why ?? Because people ( Both Calvinists and Open Theists ) try to rope me in and try and force me to accept their interpretation of the Bible. Both groups can’t be right ! There is a problem of interpretation, and assumptions, and presuppositions before going to the text. In other words, there is a problem of hermeneutics. If a person is truly honest regarding their theological position, then they will submit it to close scrutiny and questioning. If they are not honest, then they will try to avoid and divert. Chris Fisher Alright, I am changing my question slightly to a reading comprehension question. Now you don’t even have to tell us what you believe about the verse, only speculate what an educated reader would believe. 1. An educated reader would read this verse as saying that Jesus believes God would delivery him from the Romans, if he so wished. 2. An educated reader would not read this verse as saying that Jesus believes God would delivery him from the Romans, if he so wished. You are trying to hijack my thread. You are avoiding answering my questions, which are in accordance with the OP. You can of course make your own OP and have people respond to you but you show yourself as being dishonest when you avoid, and divert and try and hijack this thread. Chris Fisher Don’t be silly. Your entire thread is on if the crucifixion is necessary, and I am providing hard evidence IN THE BIBLE that this is the case. You, on the other hand, want to avoid the Bible at all costs. It is crazy to me. You will not answer a simple yes or no question about reading comprehension on a verse that directly relates to your assertions. Chris Fisher And, you engage in the moralistic fallacy in ALL your arguments. I am not at all interested in discussing bible passages. I have explained to you very clearly why. If you continue to push your agenda on my thread, then I will block you. It is no skin off my nose. Chris Fisher Yeah, good luck with your thread, mate. I won’t say good luck to you with your heresy of Open Theism. One of White’s main tactics was to pepper his comments with ridicule and expressions of shocked incredulity. Moreover, he called my motives into question, accusing me of both abusing scholarly information to hide not having a positive case and political salesmanship. And he charged me with exhibiting the heresy of Pelagianism. White’s response was simply not respectful or charitable dialogue as befitting scholarly discussion or exchange with a brother in Christ (and I regard White as brother in Christ). My plan here is to largely leave aside the ridicule and accusations in his response and to respond to anything he did say that had some substance to it. But I would urge anyone who watches his response to be alert to how often he makes disparaging comments in place of substantive arguments. Remember White’s previous treatment of Bob Enyart and Christopher Fisher. Part of my reoccurring work is on exposing intellectual dishonesty. There are several signs of intellectual dishonesty: Refusal to debate. Refusal to make monetary bets. Refusal to answer simple questions. On Facebook, there are two universal telltale signs of intellectual dishonesty: deleting comments and threads. If a belief cannot be transparently questioned, if critics must be censored, then the advocate is intellectually dishonest. 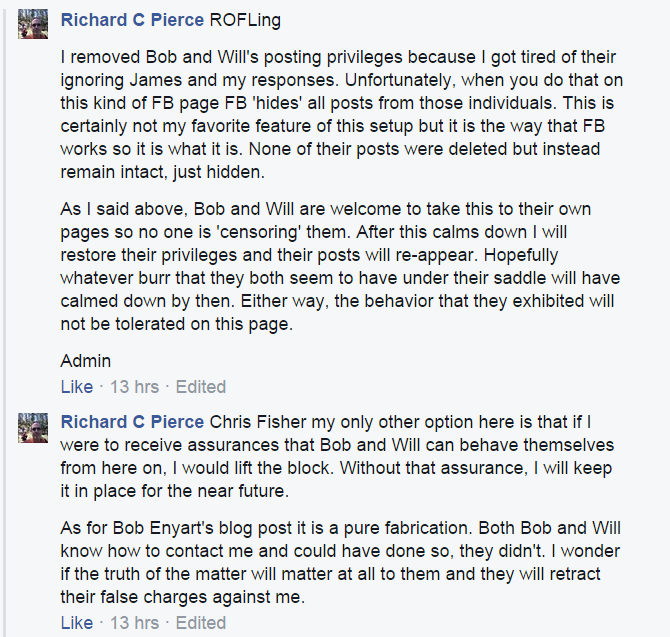 This week, Alpha and Omega Ministries censored Bob Enyart when Enyart replied on their Facebook page to an article that James White wrote against Bob Enyart. If that censorship does not show the rampant intellectual dishonesty of James White and Alpha and Omega Ministries, then I will present my own exhibit. I was censored and banned for asking questions. The intellectual dishonesty is apparent on several levels. Straightforward questions are ignored and instead were censored. The entire Facebook exchange between me and the A&O Facebook admin, Richard C Pierce, is available for all to read. It should be noted that I make zero theological arguments the entire “debate”. I take no stances and advocate no views. Instead, I ask questions. Questions are a chance for individuals to explain what they believe, to clarify. Instead, Pierce, hyper-reacts. He becomes belligerent. It is obvious he is afraid of the question. This is not unlike White’s handing of the question and answer period during the White Enyart debate. White and company are very afraid of questions. Their beliefs do not hold up to simple scrutiny. Pierce then bans me. I do get to, in the end, point out the intellectual dishonesty of A&O Ministries, which is very apparent by Pierce’s refusal to answer questions and his belligerence towards those asking questions. Richard C Pierce Chris Fisher my only other option here is that if I were to receive assurances that Bob and Will can behave themselves from here on, I would lift the block. Without that assurance, I will keep it in place for the near future. Richard C Pierce Chris Fisher How many times would you like to see it answered? James answered in this very post. The answer is yes, has always been yes and has not been anything other than yes. Perhaps you need to ask again to see if it changed? Chris Fisher So, if Jesus is the second person of the trinity and Jesus took on human nature, then isn’t that God changing? God is going from God+Jesus (no human nature)+Holy Spirit to God+Jesus (with human nature)+Holy Spirit? Richard C Pierce No, but again, Dr. White explained this, so why are you acting like he hasn’t? This whole ‘playing dumb’ act from your group is getting very tiring. Chris Fisher No seriously. No one understands it. Explain how God can incorporate human nature and yet not change. Rachel Troyer So… the second person of the trinity has a divine nature and a human nature, but before the incarnation did not have a human nature… right? Isn’t this what James White believes? Richard C Pierce Jesus is ‘fully’ God and ‘fully’ man. This is called the hypostatic union. The natures are not a ‘mixture’ therefore God is not changed. But of course, Bob Enyart knows that is what we believe. He is ignoring that in order to prop up his straw man – false case. Richard C Pierce I am sure that I could find something in Bob’s teachings that I could twist into something that he doesn’t actually believe and then play dumb while repeatedly poking at him about it and then acting like he can’t respond. Such is not honest communication. Chris Fisher Here is where I think our communication breakdown may be happening: was the part of Jesus with human nature fully God? Richard C Pierce Sigh. Again, the playing dumb act isn’t flying anymore. I just stated that there is no ‘mixture.’ This entire line is a straw man designed to tie up and waste time. The real problem here isn’t communication, it is that you don’t like the answer. Well, it is what it is so get honest with it. If you want to disagree with what we ‘really’ believe then do so. Otherwise, enough with the straw man argument. Richard C Pierce All: Before you decide to chime in for some more ‘ring around the straw man rosey’ I suggest you read the rules for this page. So, I totally agree that Jesus is fully God and fully man. Rachel Troyer I read the rules and I listened to the posts but it’s still confusing… James is trying to say that there is no change with God because God can not change in any way. So, he is saying that the incarnation was NOT a change… right? Rachel Troyer Richard, I think it is purely communication. I don’t think it’s a “straw man” argument. It seems to me that everyone thinks the same thing but some refer to it as a change and some don’t. the Word became flesh, so at one point it wasn’t flesh and at another point it was flesh… right? Richard C Pierce I am sorry that you are both so confused. Somehow, generations have been able to understand this for 2000 years. Perhaps someone has bewitched you? Chris Fisher Was the part of Jesus with human nature fully God? Chris Fisher Sir, do you believe that answers my question? If so, copy and paste the sentence that explains if Jesus’ human nature was fully God. It feels to me that Slick and White avoid simple questions and defer to distractions that do not answer critical questions. Intellectual honesty calls for transparent answers to direct questions. Richard C Pierce Guys, argue all of the little conundrums that you want. Your argument is not with me, James White, Matt Slick or a host of others. It is with scripture. You can repeat your case all that you want, you are denying the direct teaching of scripture. Was the part of Jesus with human nature fully God? Micah Burke > Was the part of Jesus with human nature fully God? This shows a startling lack of understanding of the hypostatic union. Chris Fisher Micah, yes or no. From what I gather is that you and Richard would say “no”, and then talk about the hypostatic union. But you are too afraid to write out your beliefs. Chris Fisher The fact that you will not say “yes” suggests you do not believe “yes”. You do not believe Jesus’ human side was divine. But you also do not want to say ” no” because you understand how heretical that would look. My conclusion is that you both are intellectually dishonest. Rachel Troyer Micah, was there a point before the hypostatic union where Jesus was not the God-man? This is similar to John Piper’s article on the hypostatic union. So, my question is simple, before the incarnation, was Jesus a human being? was there a human nature along with the divine nature? or did this “addition” become so at the incarnation? If so, then this is a change in God… right? Because Jesus is fully God… always was and is and will be… but wasn’t always human… right? The meaning of the verse, then, is clear. As he considers his earliest beginnings, while still in the womb of his mother, the psalmist cherishes the realization that, even then, God had planned and formed the very days of the life he would come to live. Notice how Bruce Ware words his description of Psalms 139. One thing that Ware avoids at all costs is naming the author of Psalms 139, King David. When people do not name authors of books, it is usually because they dispute who the author is (like Biblical critics avoiding Moses as author of Genesis). Ware, most likely, does not dispute that King David wrote Psalms 139, so his motive is more than likely nefarious: if Ware inserted King David’s name into his description it would vastly undermine the applicability of the text to a general audience. It makes Ware’s description very specific to one individual. Instead, Ware decides to give no hint as to who the author was. In fact, Ware never uses King David’s name in his entire book, except quoting verses containing David’s name. The meaning of the verse, then, is clear. As King David considers his earliest beginnings, while still in the womb of his mother, David cherishes the realization that, even then, God had planned and formed the very days of the life he would come to live. When pointing out that King David was writing, the generally applicability is quickly thrown into question. Of course King David led a special life that was heavily intertwined with God’s individual attention. God literally saved David from death on multiple occasions as his enemies sought to murder him. To mask this special relationship, Ware uses generalities. He calls King David “the psalmist” (as to pretend that any psalmist could replace the writer). If this methodology was used to generalize many of King David’s other psalms, the psalms would lose their meaning. But Ware wants Psalms 139 to lose its meaning. That way Ware can claim it support his views while ignoring the thousands of verses also penned by King David that do not support Ware’s concept of God. The tenor of the controversy is one thing; the truth status of open theism is another thing. I was writing then primarily about the controversy. I believe that, for the most part, it was left unfinished. The anti-open theists, mostly Calvinists, won the day insofar as they persuaded (often, I am convinced, through misrepresentation) evangelical leaders such as administrators of institutions of higher learning to shun open theists.